Who: Dustin McGowan, No. 29. Right-Handed Starting Pitcher. 6’3, 235 LBS. 29 years old. Provenance: Savannah, GA. Drafted as a high school senior in the first round of the 2000 amateur draft by the Blue Jays. Contract Status: Signed one-year, $600,000 deal in offseason to avoid arbitration. Has no minor-league options remaining. Free agent after this season. The Career Thus Far: Five MLB seasons. 80 games pitched, 60 games started for Toronto. 4.80 ERA, 1.39 WHIP, 305 strikeouts and 154 walks in 374.2 innings pitched. 2011 Stats: 6.43 ERA, 1.57 WHIP, 20 strikeouts and 14 walks in 20.0 innings over five games with the Blue Jays, including four starts. 2.80 ERA in 12 minor league starts between Dunedin and New Hampshire. Expired Nicknames: Dusty Lambchops. McGowan appears to be a real grown-up gentleman when he shaves off the Glenn Danzig sideburns, and it’s a much better look for him. Looking Back: It’s hard to even attempt to get a handle on what the past few years say about Dustin McGowan. Since 2008, McGowan has gone through surgery for a torn labrum, and a subsequent knee repair, another shoulder procedure to address a rotator cuff problem. Given all of those setbacks, it would have been easy to write off the Jays’ one-time top prospect. On the other hand, it’s also easy to get caught up in the human interest story that surrounds McGowan’s comeback bid. Jays fans are rooting so fiercely for him to triumph over all of these injury obstacles that it is easy to lose sight of what McGowan actually did when he finally got the call to return. McGowan’s September 21st start against the Angels was an outstanding outing, with eight strikeouts and two earned runs against over five innings and 79 pitches. But otherwise, the initial outings ranked somewhere between pedestrian and forgettable, with McGowan struggling to find the strike zone and showing little command over his fastball. It would be easy to write off those early outings because they were his first in the big leagues in three years, but McGowan did have the benefit of 12 minor league rehab games to get himself into proper working order. To be generous, perhaps the Jays bumped him along ahead of schedule in order to get a look at him on a major league mound before they had to start making decisions on his future with the franchise. Looking Forward: Does anyone really know? To this point in the spring, McGowan has only thrown simulated games, and while the coaching staff tripped over itself to praise the 25 pitches thrown – presumably against plywood cutouts of hitters? – it’s hard to even muster a guess as to whether this will translate into regular season success. And that’s the other piece to consider: How will we define success for Dustin McGowan? Is it hanging in there, like the kitty on the branch in the poster? Is it being a decent fifth start who can give the Jays 150 innings or more? Is it an ERA in the low-4.00’s? 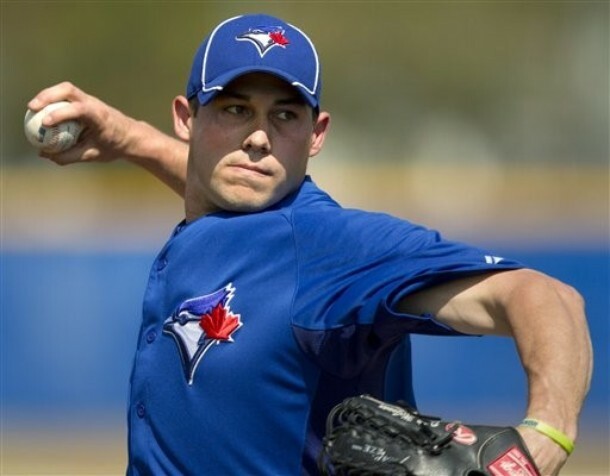 Moreover, if the team has pitchers such as Deck McGuire, Chad Jenkins, Drew Hutchison or even Kyle Drabek ready to step in and provide value for 15-to-20 starts this season, how much time are we willing to give McGowan in order to establish himself and keep the dream alive? 2012 Expectations: Having said all that, we still see some upside in McGowan, as strange as it is to talk about McGowan with the terms used for prospects. His fastball averaged 93.0 M.P.H. in 2011, and while that’s down from the 94.8 M.P.H. he threw before his injury troubles, it’s still enough to get big leaguers out. If McGowan can locate the fastball and have better command of his slider to get batters whiffing, he may earn a spot at the back of the rotation. But with free agency pending and a slew of prospects coming fast, how much patience will the Jays have for McGowan? And how much does he deserve? Tonnes of room for McGowan. Look at his profile- he has 4 good pitches, and his fastball averages 93. That's better than McGuire, Jenkins, Hutchison or Drabek can offer, in fact it's the kind of arsenal you need to be an ace. I'm certainly not saying he'll be one, but he has a better chance than anybody else in the organization, save perhaps Morrow. The injuries are a huge risk factor, and he has to show better command than he did last September, but the upside is huge. I'm willing to bet the Jays will show more patience with McGowan than they did with Jo-Jo Reyes... and we all know they gave Reyes plenty of opportunities to prove himself. This is just a hunch, but i'm more worried about Cecil than McGowan, despite all the fat Cecil has shed. Difference between McGowan and Reyes is that Reyes had controllability ahead of him if he panned out. The difference between Reyes and McGowan is that Reyes had the stuff to be at best a #3 starter. McGowan easily has the stuff to be a #2. That's a big gap.